Vincent Bonnet, known in the sailing world under the pen name of Goudis, was born on February 20th, 1955 (the same day as Joshua Slocum, but 110 years later). Four years after his birth, his parents leave France to go to work in Senegal: it is thus between Saint Louis and Dakar where Goudis grows up, delighted by the rhythm and the heat to live of Black people. At the age of 13, he is introduced spear fishing and free diving by a fisherman Lébous called Doudou Diop. The big groupers and the barracudas become his favorite target and he begins to leave the ‘regular’ classrooms more and more. Always barefoot, with his “sénégaullois” friends he has a happy and wild adolescence, but he also knows the hard and dangerous life of the fishermen, whom he often accompanies in their dugouts canoes. In 1973, when they return to France with their families, Goudis and his friends – far from being fascinated by the metropolis – have only one dream: to leave as quickly as possible, with a boat, to live a free life in tropical paradises such as the peninsula where they had grown up. They meet at first in the port of Antibes, where they work on big yachts to save the necessary money, and finally buy an auric sailboat built in 1910, which they call ‘Doudou Diop’. 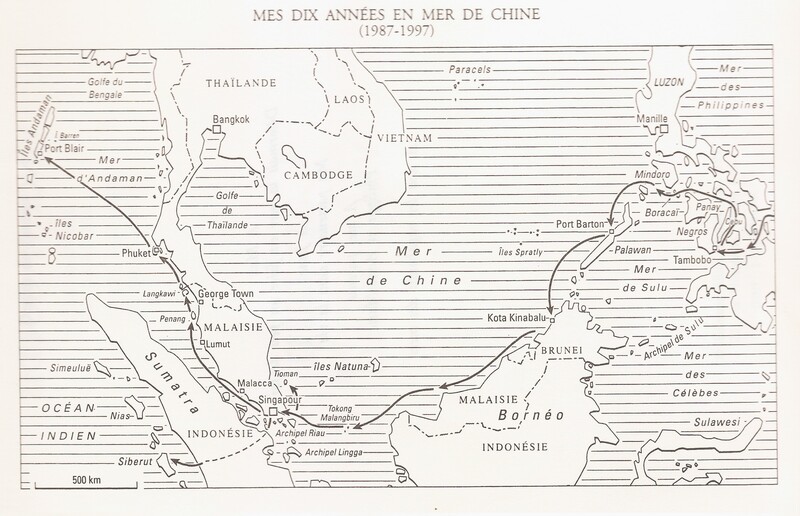 On October 29th, 1976, after 10 months of dock work to recondition the old old tub, they set sail for the great journey, with 40 Dollars in the bank, some wine bottles in the storeroom and salt water in the holds… It is the beginning of the journey which will at first see the friends joining the Senegal of their childhood, and then Cape Verde Islands, Fernando de Noroñha, Salvador de Bahia, Recife, Guyana and the Antilles. In 1979, during a stopover in Venezuela, Goudis spots an old cutter abandoned at anchor: it is a boat whose owners died in an accident, but the local authorities always refused to return it to the heirs. The sailboat was already plundered by the fishermen, and soon the rusty chain of its anchor would break. But Goudis is ready to embark on a solo adventure: in the middle of the night he says goodbye to his friends, joins his new boat by swimming across, and sets sail for St.Martin. 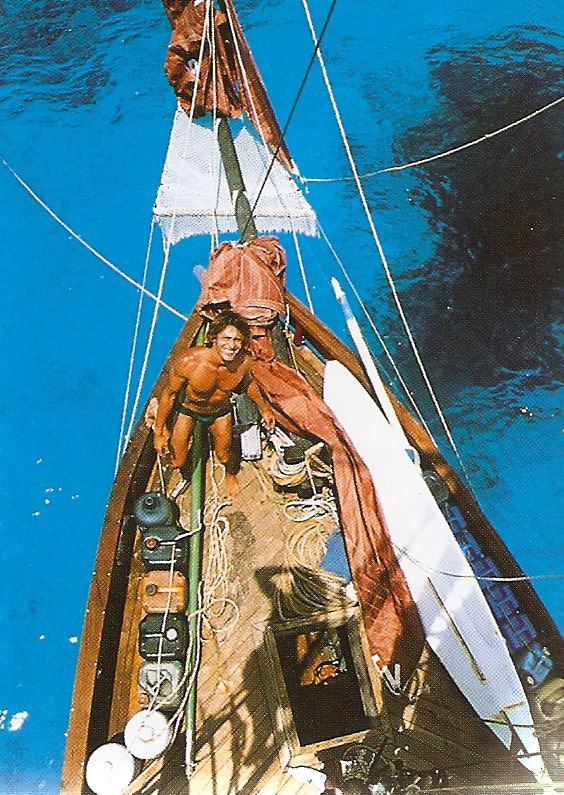 The sailboat is renamed ‘Julio Grande’, named after another big free diver known in Brazil. 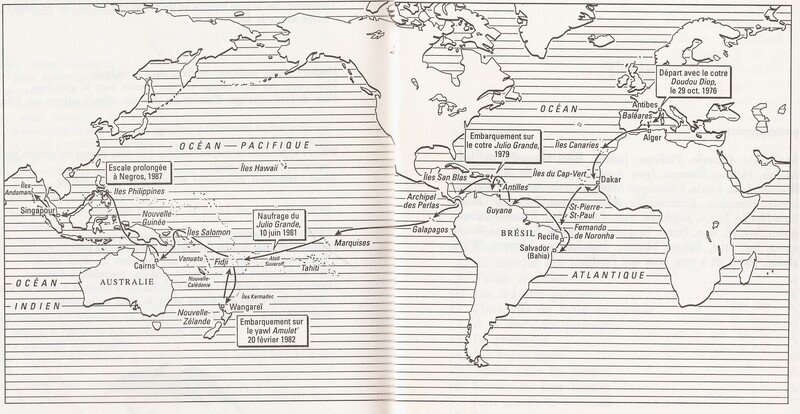 Having forged some false papers and tinkered a flag with the face of Mikey Mouse, he manages – with a lot of luck and thanks to the charm of his girlfriend, to cross the strait of Panama without serious problems, and to begin his “sans-papiers” course trough the Pacific. In June, 1981, at anchor in the lagoon of Suvarof, a violent storm crashes Julio Grande on the coral (along with other 4 sailing vessels). Goudis and his girlfriend Nadine, who is pregnant, are brought by friends’ sailboat to Fiji, where Nadine decides to give birth without assistance in the middle of the forest. The child is called Romano, in honor of the leader of the nearby village. A few months later, the three of them restart their course to New Zealand on another friends’ sailboat. In 1991 he takes a plane to spend a few months in Paris, where he publishes his first novel, ‘Wild Blue’. It is in this time when Goudis meets Bernard Moitessier, who was a member of the jury which voted for ‘Wild Blue’ at the prize of the sea literature at La Rochelle. Moitessier appreciates the book so much, that an immediate friendship is born between both sailors (before dying Bernard will ask Goudis to take care of illustrations of his textbook ‘sail, distant seas, islands and lagoons’). Back on Amulet’ in Singapore, Goudis falls in love with a June, a Singaporean girl to whom he gets married and they have a child: Vanoha. In 1992 he moves alone to Phuket. In 1997 he publishes his second autobiographical novel, ‘Captain Vagabond’, in which he redraws his adventures across the 7 seas of Asia (pirates, customs officers, weapons, drugs, treasures and exotic beauties are the main ingredients). But in the year 2000 the adventurer lives through another tacks change: Vanoha stays in Singapore with her mother, and ‘Amulet’ is sold to a descendant from La Pérouse. It is on ‘Goudrome’, a 33ft polyester sloop confided to Goudis by a friend, that in January 2001 he leaves to finally finish off his world tour, begun 25 years beforehand. In this last course (that he will describe in the book ‘Happy who, as Goudis’) he is accompanied by his new love, Yuko, a Japanese 23 years younger than him. Once in France, Goudis and Yuko buy a ruin in a small village of the Aude, and with the help of Romano and Elvis (both of his children – carpenters) they build their own wooden house. For 10 years they live happily there, by shopkeeping of small handcrafts, and Goudis even opens a tattoo studio! I discovered that his house is not far from Gruissan, and having read one of his books (of which Gerôme of ‘Petit Prince’ had spoken to us during the first season of dock work on ‘L’Alliance’) it was impossible to resist my curiosity: I got in touch with him and I went to visit him. We spent a brilliant evening at his home, he had prepared dinner with plenty of sake and good wine… The following morning Goudis even spent a good few moments under my car helping me to repair it! Last news: Yuko has just returned in Japan for good, the tattoo studio does not exist anymore, and Goudis is about to finish building a third house. Now that he does not have any more links on the ground, his plan is simple: sell or rent his nice houses and buy a boat to restart new adventures! How long is it going to take him? By knowing him, I bet that he is going to set sail before us, but if he was still to be over there on the day of our launch, Goudis will be the one to throw the bottle of Champagne on our hull! In 2014 Goudis sat sail from La Rochelle on his new s.v. Vatoo. Nowadays he e is sailing once again around the world! For further news about him check the latest comments under his biography in french. I never read his book, but your account on the Singapore bit doesn’t seem to accurately reflect the facts and sequence of events. And one would think that the name of the mother of his child (who is Singaporean) who played a major part in typing out his 2nd book would warrant a mention at least but seemed to have been deliberately omitted. Hmm.. wonder why…. I guess you are the Vanoha’s mother… I’m sorry about the inaccuracy of the parts of the biography you are invoved in: none of the omissions have been intentionally made, and I didn’t wanted to offend anybody… I just tryed to extract a bio from the 4 books Goudis wrote, hoping to match as possible the reality, but knowing that I can not be very accurate. When I submitted to Goudis this text, he just made a few stilistic or grammatical corrections, he did not delete or add any parts by himself. I encourage you to suggest me a more accurate version about the Singapore bit, so that I can correct the original. Me encanto la historia Met,gracias por compartir.Cris. hello i became friends with Vincent bonnet when we were moored alongside an old ww11 Fair-mile in cairns 1986, i was on a ferro cement vessel called Rebel, Vincent was the most charismatic fellow i have ever come across, his scrimshaw work was world class, and he was a very decent flamenco player. i have very fond memories of sitting drinking wine on the deck of the old fairmile with a few other yachties listening to his tales of wild adventure his little family were always naked and there life as did mine at the time seemed idylic. it was at this time Vincent managed to get his self on the cover of People magazine i will always remember that, Halcyon days!!!!! I too remember Vincent Bonnet from his days tied along side the Fair-mile in Cairns. 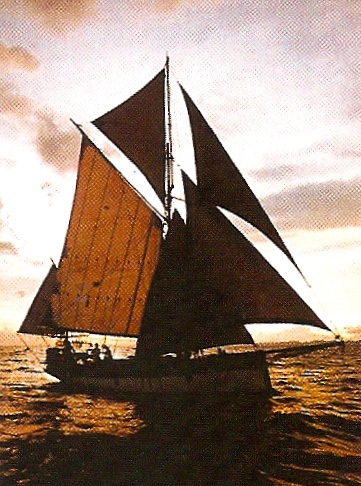 I was sailing alone on Maroomba – a small Gaff yawl. There was Luke who also had a Ferro – a Hartley – with his Samoan wife. Eric Hanquinet of Belgium sailing Boy Willie; Jon Louis the French boiler maker fresh from Panama sailing the wrong way around the world; and the Australian John (and Patricia) with their converted ozzy Pearling Lugger – fresh back from the Solomons with new Kwila decks. I was just a young man in my early 20s and learnt much from my association with these wise men of the sea. And yes, they were indeed halycon days. I can certainly attest to Vincent’s ability with Scrimshaw and with Flamenco guitar having had the good fortune to join in a jam with him and Eric a few times. He was also a master craftsman when it came to wood work. But his most outstanding skill was his sheer charisma – you felt like royalty in his presence. You did it so fast!! You’re about to set sail much before we are!! Well… Hope to reach you in Senegal one day!! Please, send us some pictures of Vatoo, so we can publish it online, and all your friends will recognize you when you get in sight! To Vincent G, via ‘Metello’ I hope both of your voyages turn out well! I can’t seem to find you on ‘face book’ would somebody care to clue me in, please.